New time just added for the March/April Session: Tuesdays 5:30-7pm. This is an art class for older children, near Norfolk MA, offering lessons in a variety of subjects including drawing, acrylic painting, watercolor painting, sculpture, composition, form, art history and so much more. 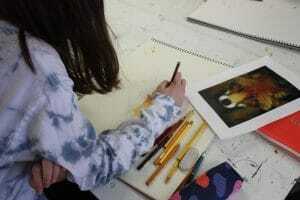 Designed for students in 5th or 6th grade, this class will grow students knowledge of more advanced aspects of art to ready them for our other teen classes like Drawing Experiments or Oils. Students can be at any level skill wise, they do not have to be advanced, but will focus on more advanced topics. Students are required to provide their own materials.